Add the flour mixture and mix until thoroughly incorporated. Measure out 1/4 cups of dough onto a greased cookie sheet and gently shape and flatten with damp hands to make 1/2" thick disks. Bake at 350 degrees Fahrenheit for 8 minutes, rotate pans, bake 8 minutes more. Remove from oven and cool. When the cookies are cool, drizzle glaze (see below) over them and allow it to set. I started the cookies at school on Friday and gave my class some as a Halloween treat. I brought the rest home to add to what I was making Saturday morning. When I unpacked them I was irritated to learn that I had packed some up while they were still slightly warm and they had fused together. I had to make an additional batch, but what to do with pieces from about 8 large broken cookies? And so Pumpkin Spice Tiramisu was born! 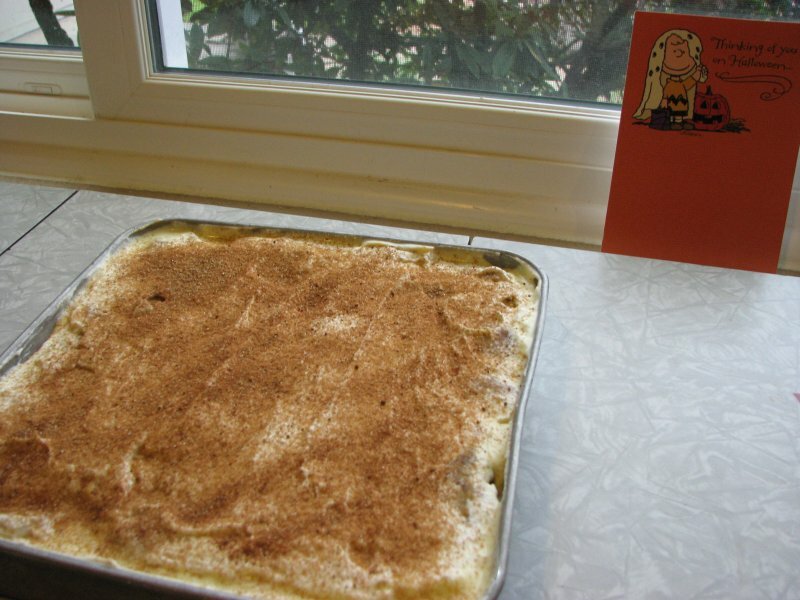 We used this recipe and replaced the ladyfingers with cookie pieces. The only other change was sprinkling the top with cinnamon, sugar, and nutmeg instead of cocoa powder. We had dinner guests last night and it was delicious then. It was even more delicious this afternoon after the flavors had more time to blend. Meringue ghosts finished up the baking triathlon! doubled as a Dracula meringue.. Although he looks a bit like Cthulhu in this picture. I love tiramisu its honestly one of my absolute favorites. I've only made it once or twice though. I love the little ghosts they're so cute!